Think in terms of what effects you want to achieve, rather than a specific product. Each of these coloring mediums can produce dramatically different results. First decide what look you're after (such as earthy tones vs. bright primary colors and uniformity vs. marbling or antiquing effects), and then work with your decorative concrete contractor to determine the best product or combination of products for your design needs. Don't rely on color charts alone. The color charts or cards provided by the color supplier may not precisely represent what the final results will be on your project. With integral pigments, the final color will vary depending on the cement color, sand color and the amount of water used in the mix. 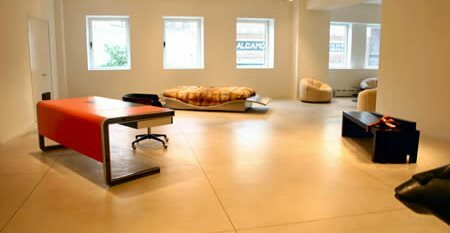 With surface-applied treatments, especially reactive chemical stains, the color can vary widely depending on the condition and original color of the base concrete. Always conduct a trial application of any color treatment you plan to use. Consistency counts. For new concrete, it's important for every batch of concrete used on the project to be consistent, including cement type and brand, aggregates and water-cement ratio. 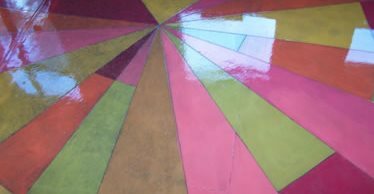 When different batches of concrete vary slightly on the same job, they may absorb stain or dye differently, resulting in noticeable color variations. Inconsistencies in finishing practices, timing of operations, and curing and sealing methods can also result in slight color variations. Consider custom color matching. If you can't find just the right color for your project, ask the color manufacturer or your decorative concrete contractor about the possibility of custom color matching. Many color suppliers are able to match existing color tones or formulate custom hues to suit your design scheme. With most stains, it's possible for the applicator to achieve custom shades by mixing two or more colors or by applying one color over another. Most dyes also allow flexibility in the end color because they are packaged in concentrated form and can be diluted or blended to produce custom hues.